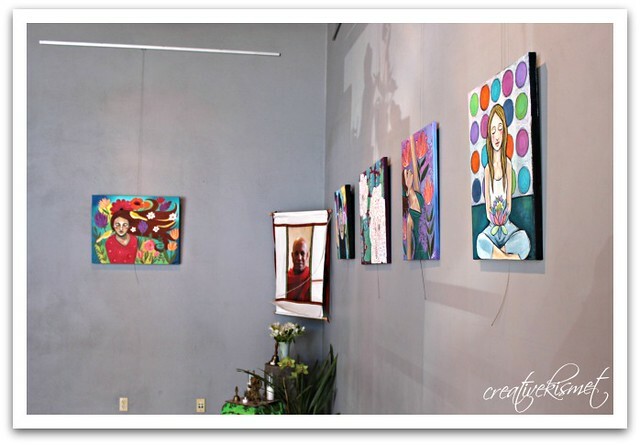 I feel so honored to have art hanging at a local yoga, dance and mediation studio, The Movement Shala. I was very intimidated, at first, by this big, beautiful space. The ceilings are so tall and my painting felt so small when I was hanging them up. My paintings feel so much bigger in my small home studio. I am hoping that my bright color choices allow them to have a big presence in this space. Don’t you just love the shadows from the Buddha in the window. We were there at the perfect time. So, my husband I just finished reading The Life-Changing Magic of Tidying Up by Marie Kondo. I will write more about it later, but the hubby and I are in massive tidying up mode. I spent the last 3 days working on my studio and all day today working on clothes. Man alive! How in the world did we accumulate so much junk! We have so much more to conquer. Be back in a few days! This entry was posted in Art, Reading. Bookmark the permalink. 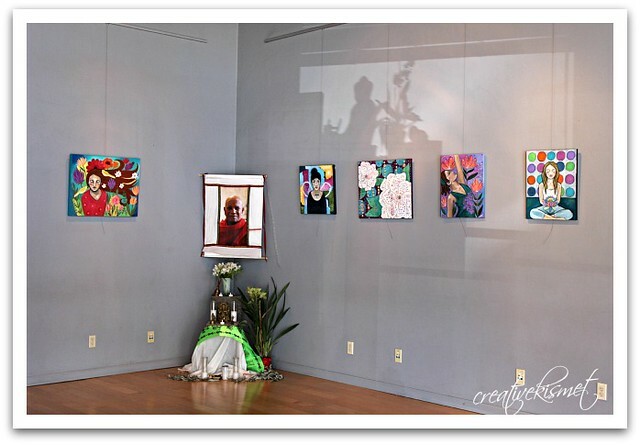 Your pictures look great in the gallery. I hate books that dictate to me about tidying up. I’m fed up with this one doing the rounds. Apparently the author used to have a tidying up thing as a young child, basically as a hobby (!) and even threw her brothers things away without his knowledge or consent. That is not good behaviour and sends out alarm bells to me. Also she rips pages out of books and throws the rest away. That’s not something to recommend her. Tidying mindfully is about passing things on appropriately, and disposing of things careful which is actually a lot harder than just putting them in the bin and contributing to landfill sites. I’m not sure everyone thinks it is so healthy to dump all our stuff, I think it is the opposite, we are a composite of our pasts and it is natural to keep some of it. Surely the point should be moderation? I don’t think books like this encourage a middle ground though. I really don’t enjoy overly tidy environments and think people who intensely dislike stuff can be problematic to others around them – not the other way around as they would suggest. I think books like this normalise their odd behaviour while trying to get us to see ourselves as having deep problems which need to be addressed. It is actually okay to keep stuff if you want to. Tidying is one thing, stripping your house out quite another. There are other people jumping on this bandwagon too; there is a woman who has a thriving community of followers running around with dusters and candles, cleaning in an orderly manner that is dictated by her web pages. All a bit too Stepford wives for my liking. Unfortunately people write whole blog posts about it, not keeping it to themselves at all but zealously gathering followers. The herd instinct can both be dull and perturbing. Personally I would find it easier to be around even a messy slob than someone who whisks the cup away before you have even finished drinking and who sees a magazine as mess instead of inviting and homely. I find the fact that these particular books become memes strange. It just encourages dissatisfaction with ourselves and encourages us to see our way of natural living (for us, the individual) as being problematic and instils a need to conform and follow the herd. Alarming! I think spring cleaning is a good thing. By making order around me every now and then, I seem to also make a little peaceful space in my mind. Right after Christmas we sent several bags of clothes and toys to the thrift shop. As new things entered our home it felt good to send other things out. AND what a gorgeous space for your artwork!!!! I like your artwork against the grey walls.